Apple appears to be experiencing another problem with its systems today, as a number of MacRumors readers have reported they are unable to activate their new iPhones. Other reports are showing up on Twitter as the problems continue. An AT&T employee has told MacRumors that some Apple Retail Stores are sending customers to AT&T stores, but indicated that those locations are having similar activation issues. There is no word yet on when users can expect the issue to be fully resolved, but a similar outage occurred two weeks ago. This is not directed to you sir .. But why is it a trend that EVERYONE thinks they know what apple needs ?? Well I can't answer that, but I can guarantee Apple need a bigger gerbil. Thats the most infuriating message ever, getting a shiny new iPhone and not being able to play with it, so you idly caress it and whispher sweet nothings to it instead, and tell it in great detail about all the things you're going to do to it once you get it activated. Sometimes I wonder if Apple's servers are powered by a gerbil running on a wheel. What Apple need to do is get a bigger, more powerful gerbil. i heard they plan on releasing a quad-gerbil wheel server soon. Ugh...that grey linen. So glad they've binned it. How dare people expect their premium devices to be usable out of the box! 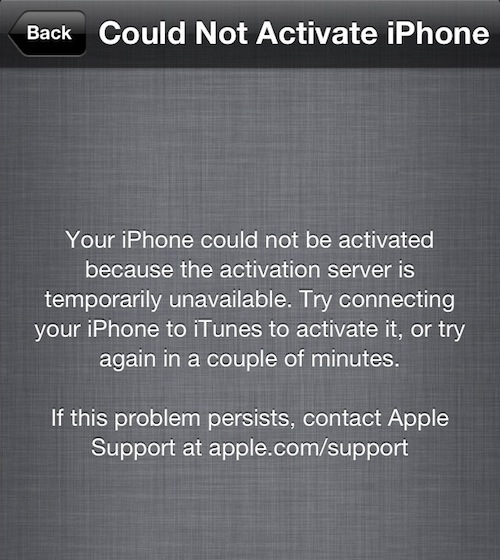 EVERY iPhone in existence has needed activation via Apple servers. I think he was referring to pre-iPhone cellphones.